LA Girl Pro Coverage Illuminating Foundation is claimed to be a full coverage, illuminating foundation that is paraben free with added anti-oxidants. For Canada, it's now available on Walmart's website for $12.99 CAD. That's where I purchased mine. 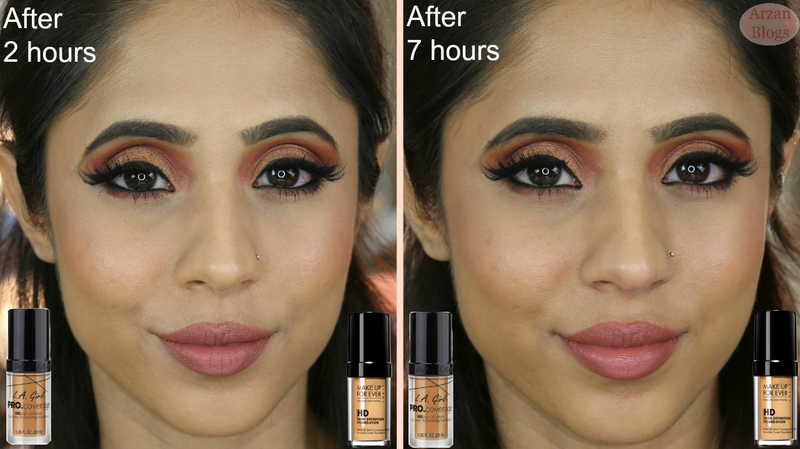 Here's my demo and review of new LA Girl Pro Coverage Illuminating Foundation (Warm Beige) with 7 hours wear test. I also compared with Make Up For Ever Ultra HD Foundation Y375 Golden Sand. 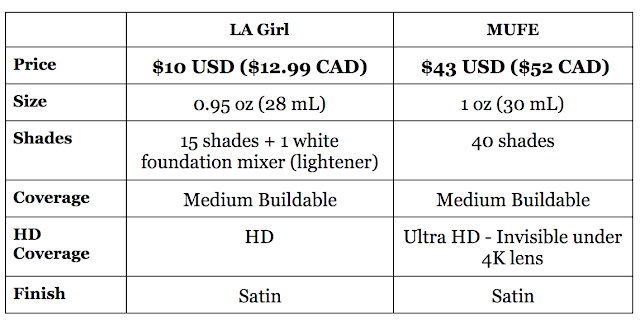 LA Girl Foundation is available in 16 shades (15 shades + 1 white/lightener). I got the shade Warm Beige and it's a great match for my skin tone. I compared it to MUFE Ultra HD Foundation Y375 Golden Sand and I think it's very similar but someone mentioned that Y385 would be a better match but I don't have that shade. 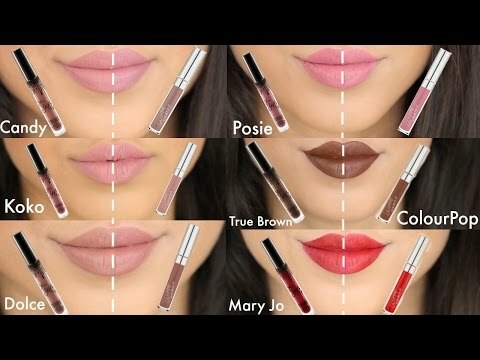 Click here for my shade reference post, where I listed MAC conversions shades & videos by other YouTubers wearing most of the shades. HD Coverage: Both of them are HD coverage foundations but Make Up Forever Foundation is also supposed to be undetectable under 4K lens. Packaging: The packaging looks very similar and both foundations come with pumps. 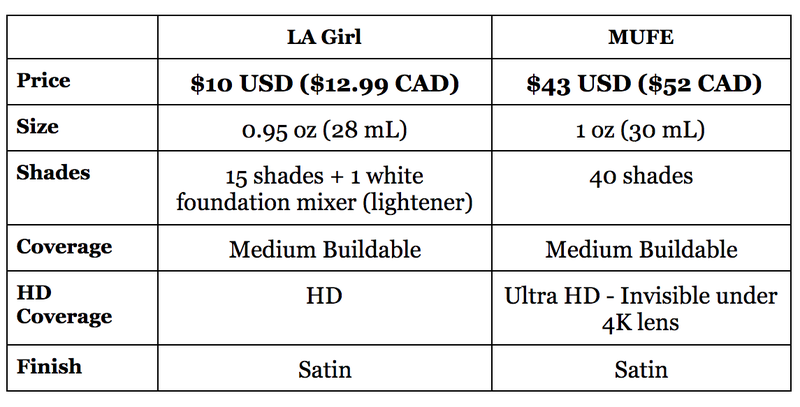 Price: LA Girl Pro Coverage Illuminating Foundation retails for $10 USD ($12.99 CAD), while Make Up For Ever Ultra HD Foundation retails for $43 USD ($52 CAD), so that's almost $33 USD ($39 CAD) of difference. Size: LA Girl Foundation contains 0.95 oz of product, which is slightly less than MUFE Foundation (1 oz). 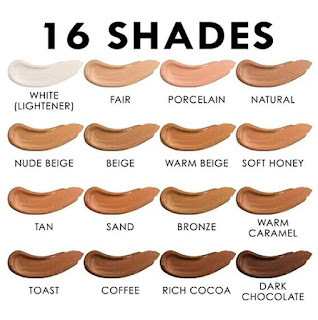 Shades: LA Girl Foundation comes in 16 shades, while MUFE Foundation is available in 40 shades, so it has a better shade range. 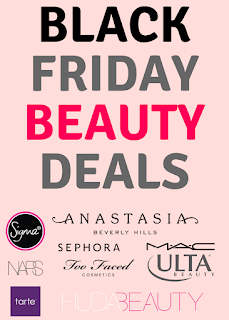 Application: LA Girl Foundation is easier to apply and build coverage than MUFE Foundation. 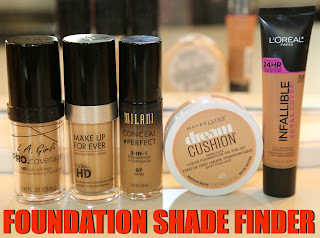 Wear Time: I tested out both foundations for 7 hours and noticed that LA Girl Foundation faded away a bit more than MUFE Foundation.